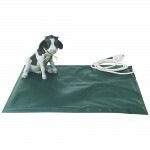 Our quality model 240v Pet Pad is manufactured in UK and whilst of similar size to our economy model, is much better made. In particular there is much more padding and insulation over the heating element, making the pad more comfortable for your animal. The vinyl material outer is also more durable, with the smooth surface being easier to clean. This mat has very low power consumption, and is designed to be left on day and night continuously. Heat is only generated when and where an animal remains in place on the pad. Dimensions are 43cm x 37cm o.a.